My recent evaluation of the Grenfell Tower fire has brought me back into the standards business with a vengeance – reminding me why I became a Eurosceptic in the first place, before the term was even invented. The issue that turned me was the implementation of Directive 71/118/EEC “on problems affecting trade in fresh poultrymeat”, a law which for the first time would require in the UK poultry carcases intended for human consumption to be eviscerated at the time of slaughter. This was so that the gut could be inspected for signs of disease, under the supervision (at great expense) of an Official Veterinary Surgeon (OVS). This apparently arcane requirement had a profound impact on the poultry trade, banning the sale of what was called New York Dressed (NYD) poultry, the staple of the artisan poultry-producer and the small butcher. The prohibition made no sense from a public health point of view, as immediate evisceration was a sure means of spreading invisible contamination to every bird in the batch processed. The Directive itself was probably a major contributory factor in the Salmonella enteritidis that we experienced in the late 1980s and early ’90s. Then there was the personal impact. The 71/118 Directive was the first of a series of so-called “vertical directives” to take effect in the UK. It had the effect of downgrading the traditional role of local authority health officers, as responsible for food hygiene, and relegated us to the role of mere “assistants” acting “under the responsibility and supervision of the official veterinarian” – most of whom were neither trained nor capable of doing the work. As a newly qualified environmental health officer (EHO), I had not gone through the rigours of training and qualification merely to be relegated by a Directive from Brussels to the role of a veterinary assistant. Nor did I agree to a measure which would have the effect of breaking up the British (and in my view superior) system of food control, in favour of the inferior system devised on the Continent. With fellow EHOs, we formed a campaigning group called FLAG (Food Law Action Group) and it what through that – losing the battle – that we learned a great deal of this thing they called the European Economic Community, and the powerlessness of our own MPs and government. Most of all, though, the experience provided a powerful illustration of how this alien entity was forcing on us systems which simply didn’t work, and which were being imposed not for reasons of efficiency but simply to pursue regulatory harmonisation which in turn was being used as a tool for political integration. My personal status as a professional was being sacrificed on the altar of European political unity. Over the years, we were to see many more examples of this phenomenon which, in practical terms, Booker and I came to call to call the “sledgehammer to miss the nut”. In purely practical terms, without any recourse to political ideology, we came to oppose the regulatory torrent pouring out of Brussels – all on the simple grounds that, when it came to framing regulations, the Community law-making machine was not very good at it. You would think that, from the inception of Coal and Steel Community in 1950, and the passage of 67 years, the “communities” – now under their new guise as the European Union – might have got better at the regulation game. But they haven’t. And the Grenfell Tower fire shows is that the problem is in the very nature of the EU, preventing it ever becoming an effective law-maker in its own right. And such is the nature of this inherent inadequacy that, as the EU gets more and more integrated into our systems of government, it will do more and more damage, causing – as is the case in Grenfell Tower – loss of life. Those who pursue the EU’s regulatory agenda have, in a very real sense, got blood on their hands. With Brexit, we are getting out just in time. I do not reach this conclusion easily, and it is only on the back of extensive research – much of which has already been published – that I offer my results. They are not black and while but rely on a combination of evidence and deductive reasoning, in the context of some knowledge of building construction and materials technology. Here, unlike some, who are quick to mock and sneer, I don’t call myself an expert. But, as an EHO – taking the diploma course – I have formal training in building construction and allied matters. Part of the course (and examination) was based on the HND building construction and technology syllabus. Further, I have practical experience of enforcing Building Regulations, alongside building control colleagues. I’ve also been trained and have some experience in enforcing fire safety in houses in multiple occupation, and am therefore familiar with the concepts of compartmentalisation and protected means of escape. As a district EHO, I’ve had more experience than I ever wanted of identifying and resolving the problems of dampness in occupied dwellings. Turning to the issues at hand, the relevance of such matters will become apparent. But first, we can take it as a given that the main (and very powerful) driver behind the Grenfell Tower refurbishment – focused almost entirely as it was on energy efficiency – was the European Union energy policy and its commitment to an energy efficiency target of 20 percent by 2020, based on 1990 levels. This Europe 2020 strategy was well-established in 2010, reflected in Directive 2010/31/EU on the energy performance of buildings, amending the 2002 Directive. This, however – as we pointed out – did not specifically require combustible cladding to be used, but nevertheless the implementation of the Directive in the Building Regulations 2010 made the use of some form of insulation an absolute necessity, if thermal standards were to be met. By then, government policy itself – with a range of inducements – made it inevitable that the tower block was going to be refurbished. Not least, under government pressure, improving energy efficiency had become a key part of Kensington and Chelsea Tenant Management Organisation’s investment strategy, it having adopted an energy efficiency strategy since August 2000. The final pieces that made this disaster inevitable are then highlighted, albeit unwittingly – almost to the extent of being “smoking guns” – in two technical papers by a Croatian fire prevention research team. Much of the content in the first is repeated in the second, but I have included both for the sake of completeness. In the introduction to the first paper, the authors note that the EU had defined its energy policy for overall energy efficiency and had harmonised this policy with the energy saving legislation and other Instruments, all of which was aimed at reviving European economy (the reference to the Europe 2020 strategy). The overall energy efficiency, the authors said, “implies reduction of energy consumption in buildings, since buildings account for 40 percent of the EU energy use and 36 percent of its overall CO2 emissions”. What they then go on to say is crucial, and goes to the nub of the whole issue. The energy performance of buildings, the authors say, “can primarily be improved through implementation of thermally enhanced building envelopes”, using several possible technologies. Thermal insulation materials, they add, can be either non-combustible or combustible. 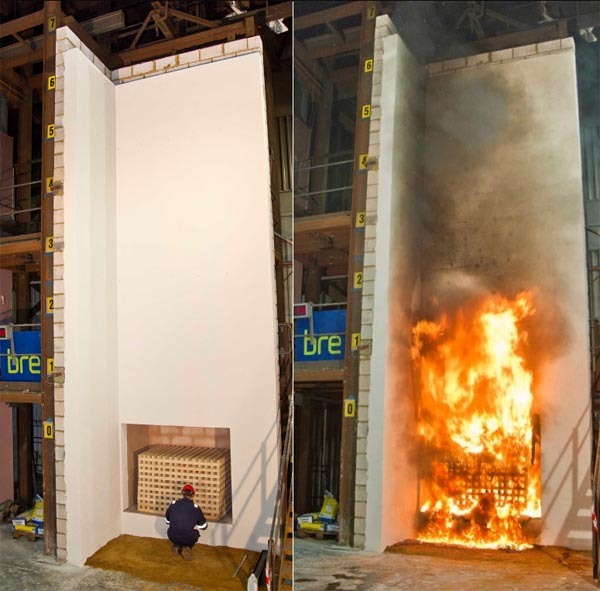 But, when applied on building facades, combustible thermal insulation materials, “can significantly increase fire load and risk of fire spread in buildings, because of reaction to fire of such materials”. Thus, they conclude: “It has become obvious that fire safety and energy efficiency of buildings are not mutually exclusive, and so stricter requirements for energy performance of buildings have to be applied, together with stricter requirements for fire performance of buildings”. It is that latter sentence which is the key. Given that combustible materials are used, stricter fire performance requirements should have gone hand in hand with stricter energy performance requirements. The two should have been locked together. Arguably, non-combustible insulation material could have been used, such as rockwool – inert mineral fibre. This certainly would have been safe to use in Grenfell Tower and, in the manufacturer’s brochure to which I have linked (which also advertises PIR), this is the only material recommended for high-rise blocks. The question, therefore, must be asked as to why, when a perfectly safe material was available, why it was not used in preference to something potentially (and in fact) more dangerous. To this, there are two answers. The first is that the polyisocyanurate (PIR) used in Grenfell Tower was 30 percent more efficient than the mineral fibre. In this case, to meet current and expected future standards, the insulation was already six inches thick. To achieve the same standard using mineral wool might have added an unacceptable thickness to the covering on the building. However, there was potentially a far bigger problem which would have militated against the use of rockwool – dampness and mould- a perennial problem in high-rise blocks. The problem with mineral fibre is that it absorbs water like blotting paper. The effects are now so extensive and serious that cavity wall injection is being likened in severity to the PPI mis-selling scandal. Although reports are mostly confined to retrofit cavity insulation, in principle high-level cladding systems are just as vulnerable to water ingress – with the added problem that inspection and remedies are more difficult and expensive. The problems, nevertheless, are well enough known for BRE to issue a cautionary note. A partial fix is to fit a vapour barrier on the cold side of the mineral wool, but it is difficult to get secure seal, and the need then to prevent condensation on the surface requires a ventilated cavity, with all the problems that entails (something in common with PIR). Thus, the technical problems with rockwool are such that the product is largely unsuitable for high-rise. As a result, specifiers had been adopting expanded polystyrene but, after a series of high-profile fires in China, Dubai, France and elsewhere, it was evident that this material presented unacceptable risks. It was here that PIR came into its own. Not only is it a more efficient insulating material than mineral fibre, it is impermeable: it will not absorb water. When Celotex came up with an apparently new variant of PIR, claimed to be suitable for over 18 metres, it must have been treated as manna from heaven. But what we see in the Croatian papers is a further acknowledgement that, to ensure fire safety when combustible materials are to be used, a new tougher fire safety test is needed. The research team recommended BS8414 for high-rise buildings. So obvious and well-known was the need for a new test regime that the European Diisocyanurate and Polyol Producers Association – the trade body representing PIR manufacturers – was recommending this in 2003, when a new German standard (DIN-4102) was being investigated (currently blocked by the German Fire Brigade Union (since April 2016) as being too weak, a situation confirmed by the UK’s Building Research Establishment (BRE). In fact, the sequence of events is damning. As far back as 1988, development of harmonised international and European testing approaches for “facades” was initiated, under the leadership of the Leipzig Fire Testing Authority. Discussions were begun to evaluate fire performance characteristics, with a mandate issued to CENELEC in 2004 (the precursor to a new harmonised standard). But work was stopped in 2005 and although the Commission later agreed that work should continue – with talks starting up again in 2007 – after a succession of meetings, discussions and reports, there has been no progress on a new standard, 13 years after formal instructions were issued to produce one. Under these circumstances, with the European Commission fully aware that fire testing standards were deficient, it should never have made higher energy efficiency standards in buildings mandatory. To ensure safety, it should have addressed the deficiencies in the testing regime at the same time. Alongside making tougher thermal efficiency standards mandatory, it should have mandated new, tougher tests – based on system testing of the type pioneered by the BRE. And as we have seen, contrary to some claims, it is not the Building Regulations, per se that are at fault, but the testing regime. and in the UK, that problem seems to have been emerging since 1991. Putting this together, had the EU made the use of enhanced insulation in buildings conditional on the application of tougher fire tests – which was within its power to do – instead of blocking national attempts to make such testing mandatory, then one can state, without equivocation, that the Grenfell Tower fire would not have occurred. The evidence is there for those that wish to see it. As to why the EU did not act, one can see that it has been obsessed, to the exclusion of all else, with its climate change targets. As such, with so much effort going into pursuing the targets and creating the legislation and policy environment needed, it simply didn’t have the resource (or the political will) to deal with the complex issues of fire safety at the same time. Therefore, faced with this conflict, the EU appears to have done what it always does – it compartmentalised and focused on what considered most important to it. It left member states to muddle on with fire safety in a system it had confused and undermined. In the past, such a strategy has served the EU well. When the problems of its own making emerge (as they did with food safety and contaminated poultry), it could always claim that “more Europe” was needed, and make another power grab. Following the Grenfell Tower fire, the Commission has been uncharacteristically quiet, perhaps in this febrile climate not wishing to draw attention to the extent of its involvement in framing building standards. It is this silence which enables the Guardian wrongly to claim that “regulations on building materials and fire safety are a matter for national governments”. So, the silence of the guilty prevails. But, after this long journey, I have no hesitation in saying that the EU created the conditions which gave rise to the Grenfell Tower fire, and then failed to take the necessary action to prevent it happening. To that extent, the EU is as guilty as any party for the fire. Given the nature and the structure of the EU, it probably could have done nothing other than what it did – which is why it cannot be trusted with responsibility for making our laws. Only national government have the resources – and the need – to look at legislation holistically. The sooner we are back to a fully-functioning, national legislature, the better.